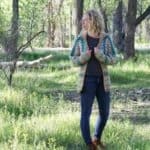 This easy crochet cardigan pattern is part of a collaboration with Lion Brand Yarn. This post contains affiliate links. 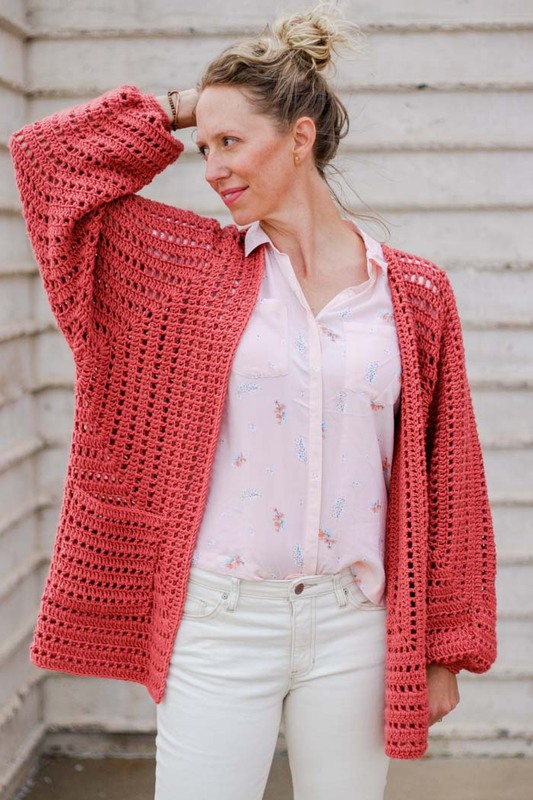 You’ve given Part 1 of this easy crochet cardigan pattern such a warm reception, I can’t wait to share Part 2 with you today! 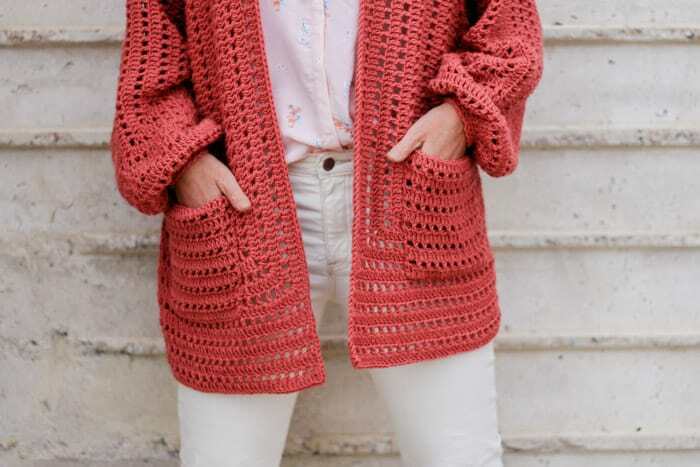 Unless you’re a master of geometry, you might find it hard to believe that this easy crochet cardigan pattern really is made from two simple hexagons. Crazy, huh? Because the hexagons do much of the work, you don’t have a lot of decreasing, sizing and seaming to worry about. You can even try on the hexagon as you work, which will keep you inspired when you get shiny yarn syndrome and want to start a new project. 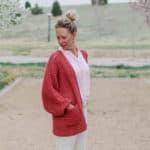 All of this makes this hexagon cardigan perfect for confident beginners or more advanced crocheters looking for a quick, satisfying project that’s different from the norm. And the yarn? 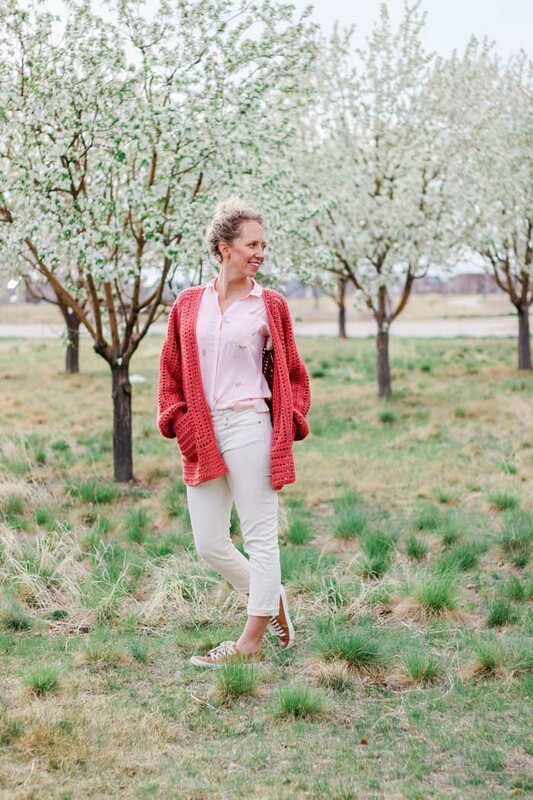 Well, this color of Lion Brand Vanna’s Style is just about the perfect shade of watermelon-meets-summer-sunset for your warm weather wardrobe. This color is simply perfection in person, but there are also a lot of fantastic colors in this line of yarn. To keep things convenient, Lion Brand has put together a kit for us. This kit includes all the yarn you’ll need, plus a printed copy of the pattern. This affordable yarn is so lovely and not readily available in stores, so snag you kit here or choose from any of the 18 gorgeous colors sold individually here! In Part 2 of the Day Date Cardigan pattern, first we’re going to extend one side of the hexagons to create longer sleeves. 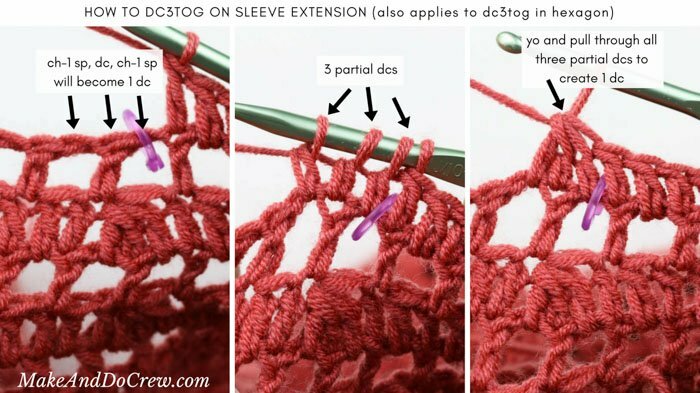 Similar to how the main hexagon was worked, the sleeve extension contains one decrease stitch to keep the sleeve from becoming massively wide. Next (and perhaps most exciting!) we’ll seam both hexagons together to form the sweater. Lastly, we’ll add a bit of length to the bottom of the sweater and pockets to the front. 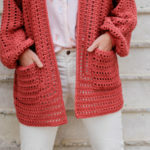 If you’re happy with the length without the extra rows or if you want an even longer cardigan, this is a section of the pattern that’s easily customizable. REMINDER: You can find the complete step-by-step video tutorial for this pattern here! 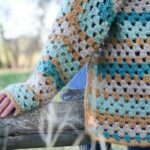 And while we’re talking crochet clothing, here are a few more FREE modern patterns and tutorials you might enjoy. You can always find my free crochet sweater patterns here. 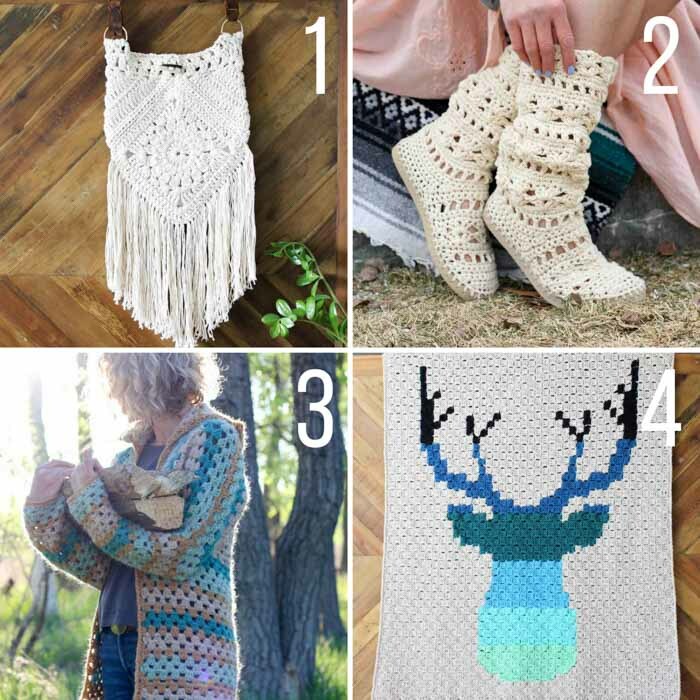 Alright, ready to finish your beautiful new crochet sweater off? Let’s do it! Purchase the ad-free, printable PDF with stitch chart and schematic here. Save this to your Ravelry favorites and queue here. Find Part 1 of the Day Date Cardigan free pattern here. This oversized, lightweight cardigan comes together almost like a magic trick. 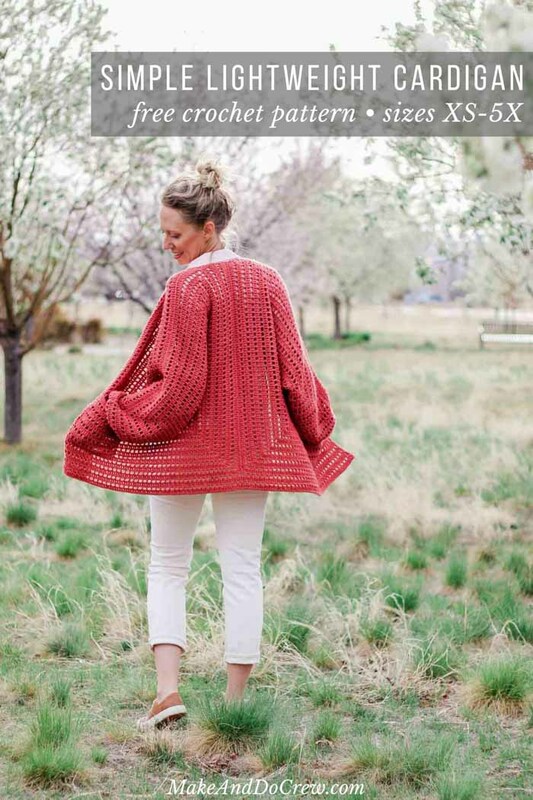 Two simple hexagons transform into an on-trend sweater complete with cozy pockets and roomy bishop sleeves. Because it’s built from two large hexagons, you can try on the sweater as you work, plus avoid most of the shaping and seaming that comes typical sweaters. 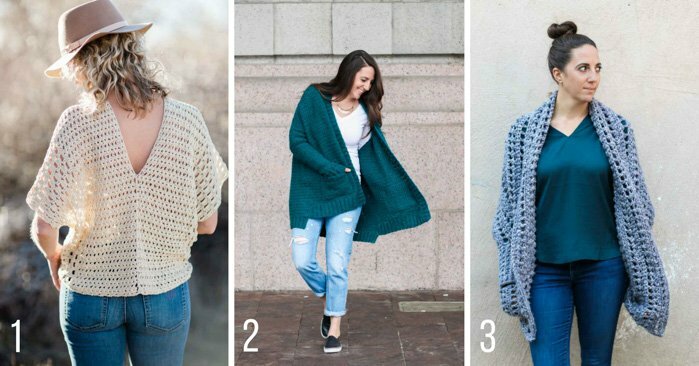 This pattern is perfect for less experienced crocheters looking to make a super wearable first garment or more advanced crocheters who want an easy, satisfying project that’s different from the same old cardigan pattern. 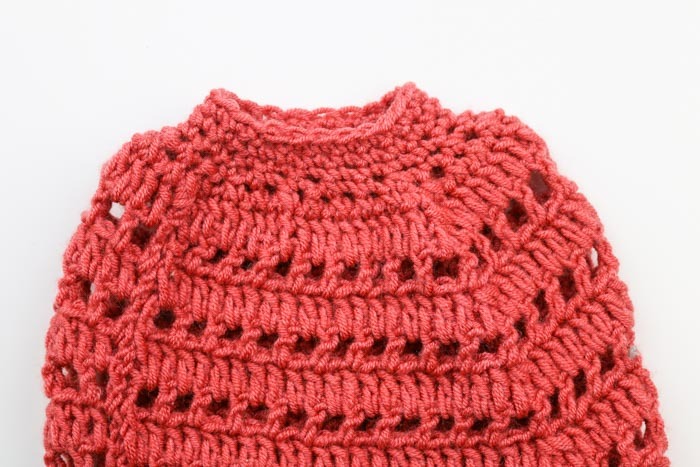 Skills required include double crochet, working in the round, double crochet decreases and seaming (tutorial photos included in the pattern below). See schematic in printable pattern PDF for more detailed pattern measurements. Sample pictured is a M/L on a 5’9” model with a 36” bust. PLEASE CHECK YOUR GAUGE and adjust your hook size accordingly to ensure your sweater fits! • Pattern is written in smallest size with larger sizes following in parenthesis. • Sweater is constructed by creating two hexagons, folding them and then seaming them together at the back and top of arms. Each hexagon begins the same, but then undergoes some adjustments to make two hexagons that mirror each other. • In order to make the sleeve side of the hexagon (Side 1) more fitted than the other sides, a dc3tog decrease is worked on the even rounds after Round 2. See photo below for details on this stitch. • Extra length is added to certain hexagon sides to extend the back, bottom and sleeves of the sweater. Right and left sides are worked differently, so please follow separate instructions for both. • Pattern refers to different sides of the hexagon by number, which is illustrated in the chart on p. 12. Think of these side numbers as fixed to the orientation of looking at the right side of the hexagon. For example, Side 3 is always Side 3, whether you flip the hexagon over or not. Side 3 does not become Side 5, just because the hexagon is flipped to the wrong side. If you’re feeling confused, lay hexagon out with RS facing and safety pin a paper “name tag” to each side so that you can easily identify them when you turn your hexagon over to the WS to begin attach yarn. • Each extension is worked back and forth in rows. • When working Row 1, check to make sure ch-1 sps line up with ch-1 spaces from last ch-1 sp row of hexagon. • Sleeve extensions are identical on both hexagons and are worked along Side 1. • As with main hexagon, a dc3tog dec will eliminate two sts from each even numbered row. The dc3tog is worked just as it was previously over a (ch-1 sp, dc, ch-1 sp). See photos above. With WS facing, attach yarn in ch-2 corner sp at beginning of Side 1. (Lefties: Also attach yarn in ch-2 corner sp at beginning of Side 1, which will be opposite of where Righties attach.) See chart on p. 12 pattern for more details on where to attach yarn. Place marker in top of dc3tog stitch from previous round. Move this marker to the new stitch as each row is worked. Foundation Row: Ch 27 (all sizes). Row 3 (RS): Ch 3, sk first dc, dc in each dc and ch-1 sp to end of row; turn. Rows 4, 6, 8, 10 (WS): Rep Row 2. Rows 5, 6, 7, 9, 11 (RS): Rep Row 3. Fasten off leaving a 24” tail. 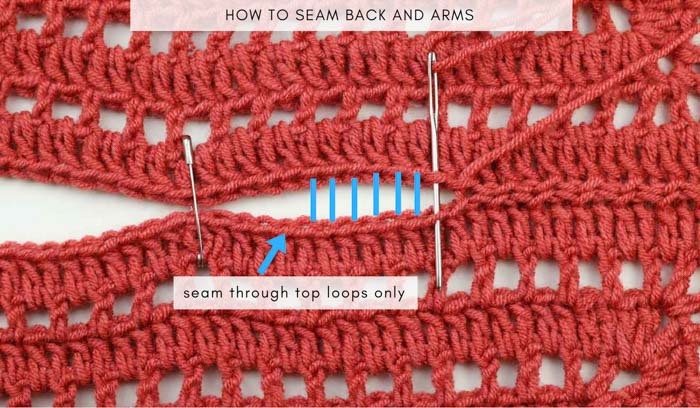 See photo above for visual explanation of seaming technique. With RS facing out, bring both corners of side 1 together to form the wrist. Pin sides 2 and 6 together to form sleeve. Take care to keep stitches lined up. You may find it easiest to visually align the ch-1 sp “windows” on either side of the seam. Hexagons should now look like two mirrored “L” shapes. See photo below for more details on folding hexagon. With RS facing out, line up both “L” shapes and pin so that once again, stitches are aligned. Next seam each sleeve, beginning at the wrist and working toward the neck. Fasten off and weave in ends. Turn cardigan so RS is facing out. Join yarn in ch 3 from beginning of last sleeve row, which is now located at the sleeve seam. Do not work a sc into this ch 3 st, instead, begin Round 1 in the next dc st.
Rounds 3-5: Ch 1, sc in each sc, sl st to first sc from beginning of round to join. Rep all steps on second hexagon. • If you’d like extra to add optional extra length to cardigan bottom, work additional repeats of the following rows. Row 1 (WS): Ch 4, sk 2 dc, dc in next dc, * ch 1, sk 1 dc, dc in next dc; rep from * to end of row. 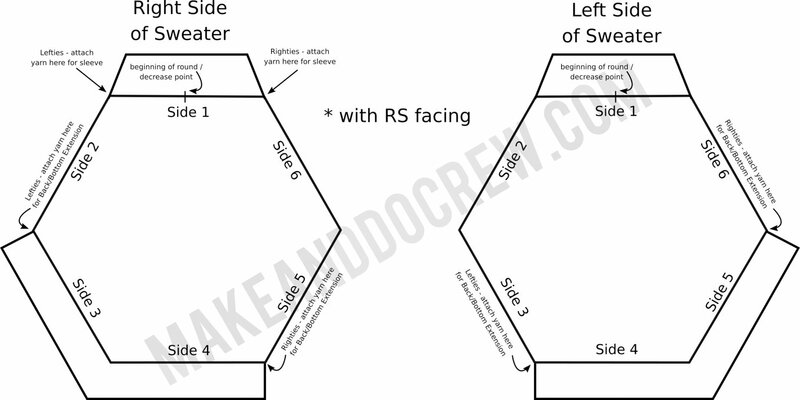 Row 2 (RS): Ch 3, sk first dc, dc in each dc and ch-1 sp to end of row; turn. Rep Rows 1-2 (1) additional time or until desired length is reached. Do not fasten off. Proceed to collar border. With RS facing, yarn should be attached in bottom right front corner of cardigan (left front corner for lefties). Collar border is worked with RS of sweater facing. Border Row 1: Ch 1, 2 sc into side of each dc row of extension, sc in each dc up cardigan front, 2 sc into side of each dc around neck, sc in each dc down cardigan front, 2 sc into side of each dc row of extension. Fasten off. Referencing photo above as a placement guide, pin pocket to cardigan front with RS of pocket facing out. Place lower edge of pocket approximately 8 rows from lower front. Using a tapestry needle and tail of pocket, whip stitch to join to cardigan front. Rep with second pocket on opposite cardigan front. Weave in all remaining ends and promptly sprint outside for a day date with your inner crochet artist! 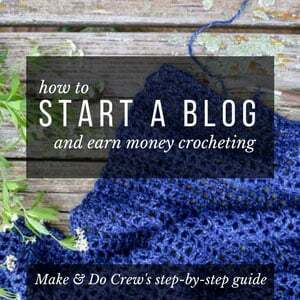 « Part 1: Day Date Easy Crochet Sweater Pattern – Free! Hi. I’ve been working on the hexagon swester and ready to make extensions. But onlt see sleeve and bottom extention. Not sure how to do the side foe the front. Hi Jess, I am back again with a question on the sleeve extension. I have my 67 dc. When I complete my first row of the extension for my sleeve I wind up with 35 instead of 33 spaces. Then I row two I wind up with 69 dc instead of 65. I line up correctly so should I keep going or is my sleeve going to wind up too big. Not sure if I should do an couple of decrease to get it to the right count. I am so anxious to finish the sleeves and sew it up. Can you help me?